BBC World Service - Newshour, Who Is South Africa's New President? Who Is South Africa's New President? Cyril Ramaphosa has become president of South Africa. Who is he? 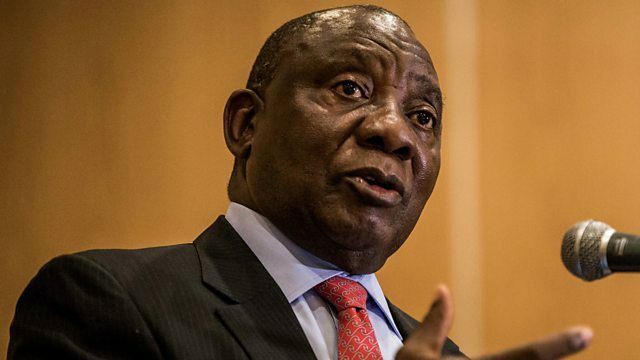 Cyril Ramaphosa has taken over as president of South Africa, after Jacob Zuma resigned. Mr Ramaphosa says fighting corruption will be one of his highest priorities - but can he deliver? Also in the programme: the authorities in Florida release more details about the deadly school shooting in Florida; and how a trans-gender woman has been able to breastfeed her baby. Photo: South African president Cyril Ramaphosa. Credit: Getty Images.